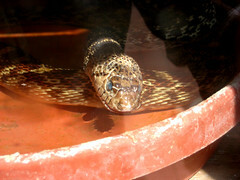 Baby quenches her thirst (one), Baby the Bullsnake drinks her fill of water on a warm spring morning, April 2009, photo © 2009 by Jim. All rights reserved. 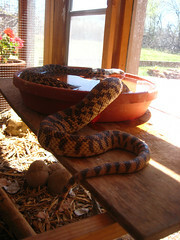 The other morning Baby the Bullsnake was lying in her empty water dish, breathing hard as if she were panting. (Do snakes pant?) I’d gone into the potting shed to water the geraniums, and as much as I wanted to open her cage and relieve her thirst, I was afraid she’d moved suddenly and send me fleeing from the shed, screaming. So I did what any sane person would do; I called Jim. 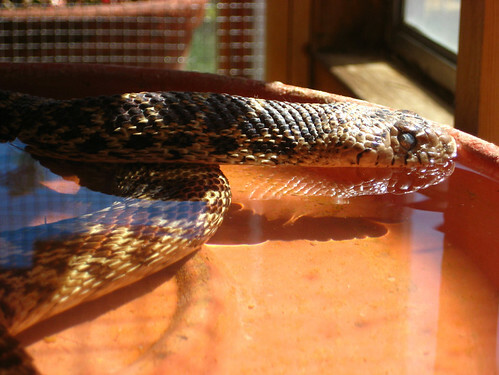 Psst…have you ever seen a snake drink? Jim poured the water into her dish while Baby was in it. I expected her to jerk forward and come slithering out. 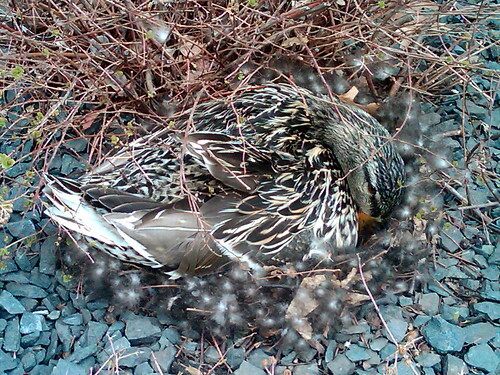 But she lay there, letting the water swirl all around. She got to the task of drinking right away, floating in the water like an alligator, eyes and nostrils above the surface, mouth below. Then she appeared to inhale deeply, breathing the water in as if parched. Speaking of water, Jim irrigated earlier in the week and ever since a hundred or so Mallard ducks have been frollicking in the field. They really do look like those shooting range carnival games where the little duck swims back and forth, back and forth. These Mallards swim along the channeled grooves dug into the field for the purpose of irrigation. They’re fun to watch. They dip their heads underwater and shake vigorously. Jim says they’re pulling up the grass to eat. That’s why property owners chase them away, he tells me. I ask him why he doesn’t mind having them. Because they’re part of nature, he says. A duck walks into a pharmacy and asks for Chapstick. The cashier says, “Cash or credit card.” “Just put it on my bill,” the duck replies. 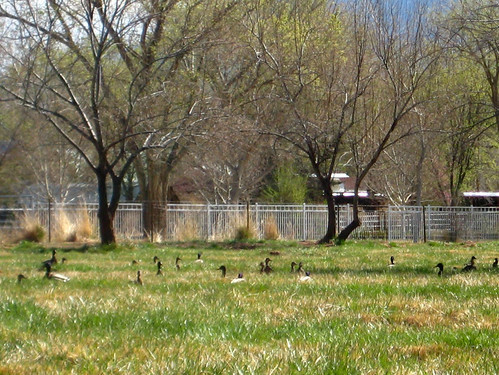 Ducks in the field (one), pairs of Mallard ducks frollicking in the field after irrigation day, April 2009, photo © 2009 by ybonesy. All rights reserved. 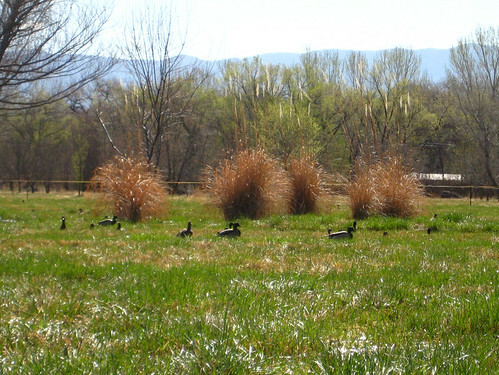 Ducks in the field (two), you can just make out Mike and Mallary Malloy to the left of the Ortegas, April 2009, photo © 2009 by ybonesy. All rights reserved. -related to posts Baby Wakes From Her Nap, Who Said Snakes Aren’t Cute?, snake awake haiku, and sticks for legs and arms.